Grizel Luttman-Johnson has won the Open Drawing Competition 2015, run by The Plough Arts Centre. Grizel previously exhibited at Bideford Black : 5 Local Artists, where she explored the blackness of Bideford Black, using it as a drawing material and as a surface to scratch into. 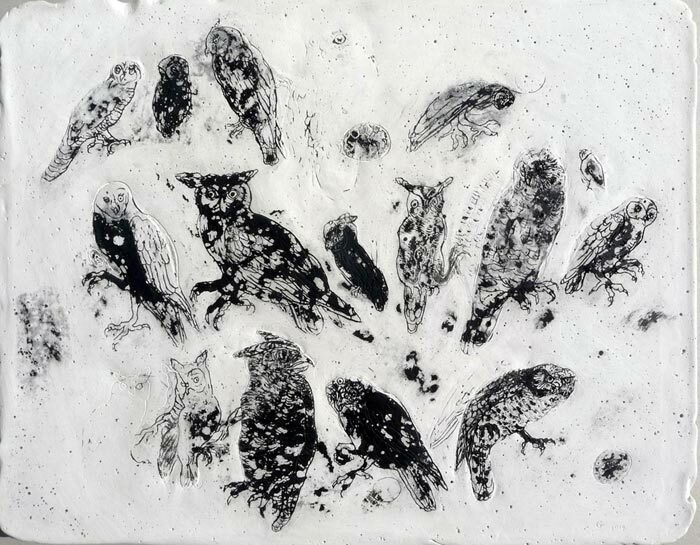 Grizel used Bideford Black on a plaster block to create her winning drawing Attempt at a Haiku of Owls with some of the owls reduced to eggs, which can be viewed at The Plough Arts Centre until Saturday 24 October 2015. This is beautiful . Wow Grizel .